Today's post and today's outfit was all inspired by this lovely peach jacket right here! I actually bought this blazer at Topshop a few weeks ago and completely fell in love. I am personally a huge fan of the whole female suit trend. Honestly, I love the concept of females wearing traditionally masculine items and shapes. To me the shape of this blazer fits the bill! It is far boxier than any other blazer I've owned before and I adore the double buttons. When I first put this blazer on I felt like I embodied the masculine shape trend and gosh darn it I felt so happy and confident. For this outfit overall I wanted to continue on with the feeling of a style that isn't entirely expected. Typically when I look at a blazer I think professional and office appropriate. So naturally when creating this outfit I gravitated towards one of my more scandalous tops and my baggiest jeans just to continue to force myself out of my styling comfort zone. I feel really good about the final product of this outfit. I think it's definitely different from my previous outfits and that always makes me happy. When it comes to styling I'm a sucker for anything unexpected and out of the norm. Like, say, a masculine item on a less than masculine individual or a blazer with jeans from Goodwill and a real low cut top? Looking at these photos hopefully you noticed one more item that is a little unexpected for me! I'm not normally a huge jewelry person, but I am in love with my new JORD Watch. 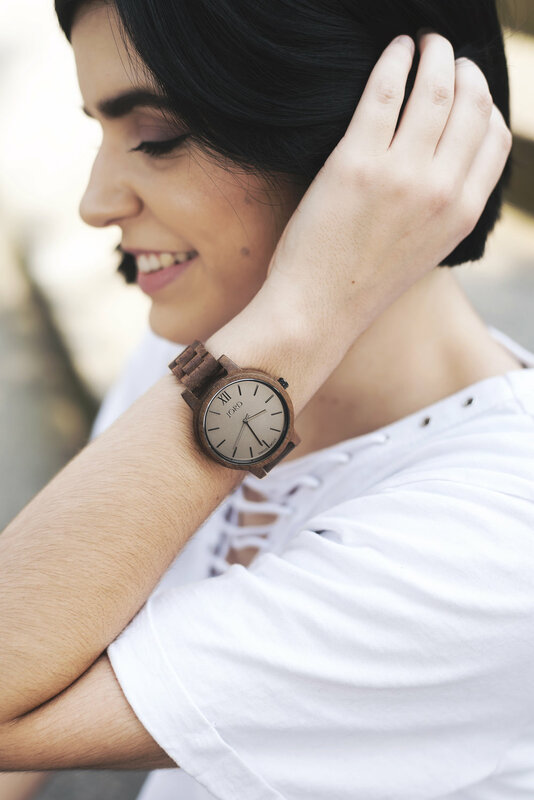 JORD is an awesome company that creates unique and stylish wood watches. JORD does a lot of work with bloggers and Instagramers and when they reached out to me to do a giveaway for my followers I was pumped! Here is the link for my giveaway, https://www.woodwatches.com/g/disingenuously_dressed. Every person who enters will be entered to win a $100 gift code to use on the JORD site. One lucky person will win, but everyone will receive a consolation code worth $25 once the contest ends. It would mean a lot to me if you entered my giveaway and trust me looking at JORD's styles you'll want one of these watches! If you know me personally you know that I moved to North Carolina from Washington about four years ago and now I never shut up about how lovely I think the Pacific Northwest is. Anyway, I try to visit the Seattle area every year to visit friends and family, and I just got back from my most recent trip. While I was there I had the pleasure of working with a local Seattle photographer, Karya Schanilec! I found Karya on Instagram and knew I had to shoot with her! Karya works with a lot of Seattle fashion bloggers and her feed is a dream. Her photos are stunning! I feel as though she incapsulates each individual's style and feeling, while including her own voice as a photographer. Karya creates some pretty fun, beautiful, and emotional photos. I highly recommend checking out her Instagram and her blog. If you're in the Seattle area you should definitely shoot with her! Before I leave I wanted to mention that I had said I wanted to post on here twice a week, but I think I've been stretching myself a little thin and I'm definitely stressing myself out! So for right now you can look for posts from me once a week, every Friday. I hope you have a wonderful weekend and maybe even try something that might not expect.